NEWS: EHF joined sports organisations from across Europe in Lausanne to continue work to develop education for sports officials. 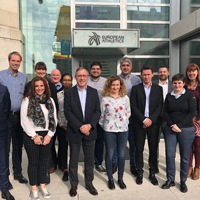 The European Handball Federation has continued its participation in sports officials education project ONSIDE, attending the third full partner meeting at the European Athletics headquarters in Lausanne, Switzerland. The focus of the meeting was to consider the results of four phases of research carried out since the last ONSIDE meeting. The research included telephone interviews with nine European sports federations and an online survey among national federations. The survey got responses from 247 respondents across 50 sports, representing France, UK, Bulgaria, Romania, Malta and the Netherlands. ONSIDE partners analysed the results, focusing on key workforce development themes including recruitment, retention, skills, education, and current challenges. Delegates also debated the levels and models of sport officials, and produced a working definition of sport officiating which will be the starting point in the production ‎of competency standards. At the next meeting in Bucharest, Romania in March 2019 the first set of outputs will be finalised. Led by the European Observatoire of Sport and Employment (EOSE) and Sports Officials UK, the ONSIDE partnership has brought together European and national sport federations, a sports council, national Olympic committee and a university. Sport organisations across the EU, including the 11 partners, recognise the need to improve the image and recognition of sport officials. They will provide them the opportunity to enhance their skills through innovative education, including new e-learning courses. EOSE director of standards ‎Ben Gittus said: “The partners are working together very well as a team to tackle this challenging skills development project. The research phase considered at the meeting has laid a solid foundation as we move in to year two of the project".